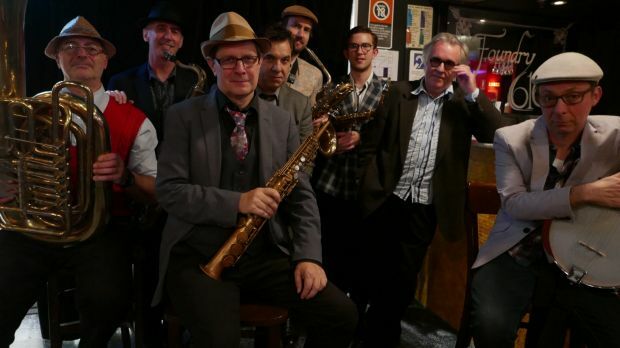 Blokes in boaters with banjos and clarinets were so ubiquitous in Australian pubs decades after the so-called trad-jazz revival of the 1960s that, for many people, the term jazz still primarily conjures up that music. These days classic jazz is the preferred name for the idiom which, from its inception in New Orleans, swept the world in the 1920s, and it is this that Phillip Johnston’s Greasy Chicken Orchestra sets about hatching anew. Johnston has always understood that jazz’s century-long history is a rich resource rather than a cramping liability, and with this band he immerses himself almost completely in this era of energised, good-humoured (and humorous) dance music. But instinctively he indulges in a little free-range reinvention amid the revivalism, most particularly in shunning the conventional trumpet/clarinet/trombone frontline in favour of soprano, alto, tenor and baritone saxophones, plus the usual piano, guitar/banjo, bass/tuba and drums. This made for a less brash, more nuanced and blended sonority, combined with an emphasis on pinpoint arrangements and concise solos. The works of Jelly Roll Morton and a young Duke Ellington provided the repertoire’s heart; music that was played with great affection and considerable panache, despite the arrangements (and rarity of gigs) necessitating all eyes being glued to charts virtually throughout. Paul Cutlan’s creamy tenor sound played a big part in lending the music a certain voluptuousness, and his little solos were highlights, as were his exchanges with baritone player James Loughnan on Lil Hardin Armstrong’s Struttin’ With Some Barbecue, the melody of which was punctuated with deliciously sly asides from Peter Dasent’s piano. Johnston’s soprano shone on That’s a Plenty, and the remaining players – Evan Harris (alto), Tim Rollinson (guitar/banjo), Steve Elphick (bass/tuba) and Nic Cecire (drums) – all had their moments in the sun. The band as a whole is already massive fun, so imagine if it could work often enough to ditch the charts. It might go ballistic. Greasy Chicken Orchestra: one night a month, Foundry 616.